In designing a family home, one important aspect that you must consider are the bedrooms of your children. Once you have decided which room would be best for your child or when you have settled on who gets to share a room with whom for big families, you will then have to concentrate on the design details, particularly on the color, structure, and the interior design. For adults, a bedroom might just be a place for sleeping. For children, however, their bedrooms are so much more than that. It serves as their refuge where they can also play, study, and relax. This is exactly why decorating a kid’s bedroom takes so much more consideration than anyone would than designing an adult bedroom. This is also an area where children can learn to best use their sense of imagination, which requires the need for a range of children’s activities included in the room’s overall design. With this in mind, it is important to include areas where they can play fort as well as paint or draw. Today, it is important to include a space to position the computer, which the child can use to study and do their homework as well as to occasionally play games on. There should also be a spot in the bedroom for the development of their skills in problem solving and eye-hand coordination. This is commonly best served with a comfortable rug placed so that blocks or other building games can take place. It is important that there is constant upgrading on the room design of your child. Through this, you can ensure that it is able to cater to the needs of the specific stage of development that they are in at the moment. Although it can be rather tedious, one of the best things in decorating your children’s bedroom is the variety of designing options to choose from. Although you can very well hire an interior designer to do such a task, doing it on your own allows you to do things as you think your particular child will like. Also, your little one will tend to appreciate it more that you have done such a personalized thing just for them. Considering that your child will be sleeping and playing in the room, it is only fitting that their bedrooms be designed according to their tastes and needs. If your child loves cartoons, have the walls painted with a picture of his or her favorite cartoon character. You can also use children’s bedding to compliment that themed design and style. Ask your children what they exactly want out of their bedrooms. Ask for suggestions and recommendations on how they would want you to go about the designing and furnishing process, whether it be colors or styles. Children will highly appreciate it if they are involved in the planning process. Aside from giving them the chance to voice out their opinions, participating in such a project will develop their creativity and help build their self-esteem and teamwork values. Most of all, it will strengthen your bond with them. The fact that you are decorating for a child should already give you an idea of the added care and considerations that you will have to factor in the entire process. Ensure that the floor has the necessary padding so that it is soft to step on for the child’s soft feet. Never ever leave the bedroom’s floor completely bare so that there is always a place to just lay, roll around or design the best racecar track or tea party. All the rowdy playing of children places them at risk for falls and bumps and a hard floor would not give them a very safe landing. Cover such surfaces with a carpet or large rug. Do not use those furry types as it can accumulate dust and be a breeding ground for germs. In decorating the walls, make sure that you are using non-toxic paint. Children are very sensitive to chemicals so it is important that you check the types of paint that you use. Water-based paints, like latex, would be the best option. You can also opt to take an alternative route, and use wallpapers instead. Safety should also be a top priority in the whole decorating process. Pick furniture pieces that are well-polished with curved edges. Put soft covers or padding on those hard and sharp edges, should they have any. Doing so lessens the risk for bruises, cuts, and other injuries. Also, if you intend in equipping the room with electronics, like televisions and video game players, make sure that they are properly installed to lessen risks and slipping from tangled wires. Finally, create a section of shelves in the room where the kids can properly organize and keep their toys and other playing materials. Make sure that there is a designated place for every kind of toys for organizational purposes, like the electronic toys, stuffed toys, board games, and many others. This will help them to learn the importance of organizing and will be a big help in preventing clutter in the space. One of the most important aspects of a child’s bedroom is the furniture. Aside from the bed, shelves, and cabinets, one very important piece of furniture is the seating. Because of their relatively smaller size, it would be unwise to equip the room with chairs that are made for adults. It would also be highly appreciated by the child if they are provided with chairs that exactly fit them. Also, because they are made especially for children, you should somehow have an assurance that these seats have been built and equipped with the necessary safety elements to deem them appropriate for kid’s usage. Chairs, along with their partner tables, are very important avenues to eat, create crafts, and read books, among many others. It will also be a good place for them to lounge in as they watch their favorite movies or cartoons or when they play house with their friends. Today’s market is already teeming with child-sized chairs in a wide variety of style, colors, and designs. Looking at such choices, children would most definitely have fun selecting and using their first fixtures in the comfort of their bedrooms. Parents and their kids can take their pick from children’s rocking chairs, reclining chairs, bean bags, and even miniature couches. 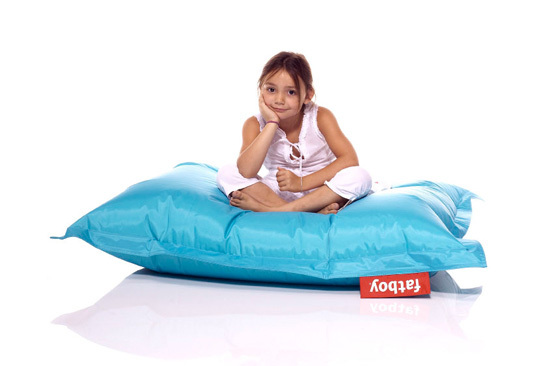 One particular kind, the bean bags, is slowly growing more and more popular as a piece in children’s bedroom. It provides a very comfortable place for sitting and reclining for small children. The Fatboy Original Junior, for example, would be a fun and imaginative toy for your child. It can work as an extra seat, a semi-bed, a place to land on, or just as an all-around prop for your child. It also comes in a variety of color options so there is bound to be one that carries your kids favorite hue. When shopping for children’s chairs, it is important that you take your child along with you to the furniture store or the department store. If you do not have the luxury of time, you can simply do all the shopping at home. There are so many online catalogs that give a wide variety of child’s seating designs and styles. Also have your children sit beside you in the comfort of your home, as you browse through the catalogs. Just like when you are purchasing furniture for any part of the home, it is also important that you consider the theme and color palette of the space that you are looking to furnish. However, keep in mind that your child must also have a say in your picks. Along with safety, functionality and durability are critical in the selection. Of course, you would want something that will not only keep up with the raucous playing and treatment of children. You should also ensure that it is able to withstand wear and tear for quite a long time, or at least until your child outgrows them. This is especially important if you intend to pass these items on to a younger child or toddler in the future.